Somebody (I don’t remember who anymore, sorry!) asked me for a post of all the books I read in 2015. Since I’m on Goodreads, I like to do the yearly challenge. Last year I set my goal at 25 books. I figured a couple a month was a fair goal with a new baby and all. As you can see, I surpassed that goal; I read 35 books! I credit my students and our Reading Workshop. Since I have told my students that reading matters, and that when something matters, you find time to do it, I have made a commitment to reading every day. Usually I do it after the kids are in bed, but sometimes, if I’m not conferencing with my students, I will read my book when they have their reading time. In fact, because of this I am already on my second book of 2016! 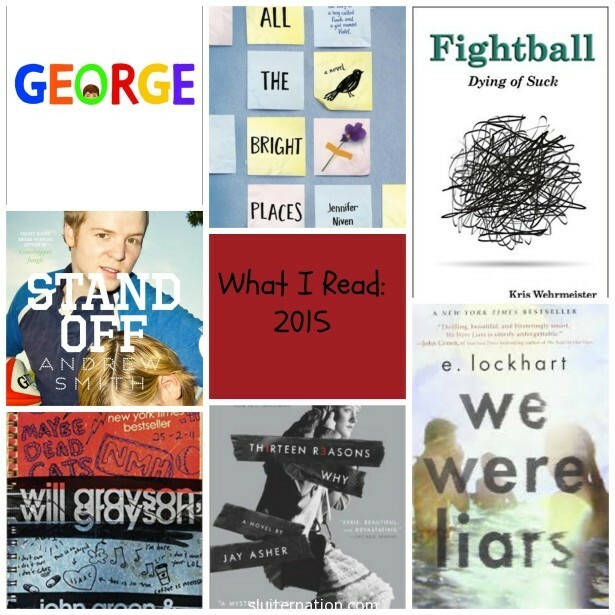 This is a look back at the books I read in 2015, in order that I read them. I am too lazy to link to all of them, by the way, but I know you all know how to use the search function on Amazon and Barnes & Noble. I put the MUST READs in bold if you need some to add to your to read list (although to be fair, there is not a book on here I would say “meh” to. They are all recommendations, really. Just get them all, but read the ones in bold first). The books with a * are Young Adult Lit. This year I set my goal at 40. I think I can do it if I keep up the momentum that I set for myself in 2015. Another thing I started doing this year is writing in a Reader’s Journal. I want my students to do this, so I model it by doing it myself. I have my notebook available in the classroom for students to flip through to see examples. They also like to flip through it for book recommendations. I admit I love reading their notebooks for this same reason. My To Read List grows as I talk to my students and read their thoughts about their books! Knowing my students are looking to me as a model reader helps keep me reading. I try to read a mixture of Young Adult Literature and “regular” fiction/literature, just as I try to read a variety of fiction and nonfiction. That is part of my modeling for students too. Sometimes they get stuck on a genre and I want to show them there is awesome stuff across genres. My other book goal for 2016 is to increase my classroom library by 100 more books. I added just under that (82 books) in 2015, so I think I can hit that goal this year. Right now my records show that I have 928 titles, and if I can surpass 1000 by the end of the year? Well, I will be ecstatic! To think that in the spring of 2014 I only had 104 books is crazy! If you want to help, I keep a Wish List on Amazon of books that my students request as well as books I read about that I know my students will enjoy (I read a lot of new release and award lists). Now tell me…what are you reading? What do you want to read? What should I read? I’m going to refer back to this list when I get stuck for a choice. Right now I’m reading “History of Mistresses”. It’s non-fiction and covers the idea and position of mistresses across different cultures. I just finished the section on Camilla Parker Bowles. I am going to do a book list post too – I also read 35 books! We might as well be twins. I mean, I don’t have a baby or anything, but still. And you really inspired me to read more, as well as gave me some ideas on good books – We Were Liars was one of my favorites. Two books a month was my goal for 2015. I’m nervous about raising that number for 2016, even though I totally dropped the ball in December and could probably read more if I really wanted to. Good luck on your reading goal for 2016 – 40!!! Thanks for some of the suggestions! I’m reading Brene Brown “Rising Strong.” Highly recommend all of her stuff. I Loved We Were Liars! Thanks for sharing your list!